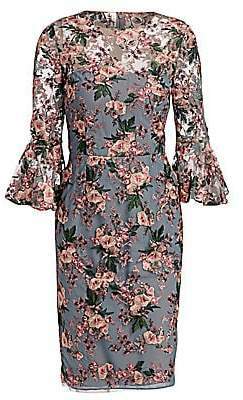 Pretty cocktail frock with allover floral embroidery and bell sleeves. Roundneck Three-quarter bell sleeves Concealed back zip closure Back slit Lined Nylon Dry clean Imported SIZE& FIT Sheath silhouette About 46" from shoulder to hem Model shown is 5'10 (177cm) wearing US size 4. Dress Collectio - David Meister. David Meister. Color: Pink. Size: 2.